Since VOC concentrations discharged from air strippers are usually low, the oxidizer seldom requires active vapor control. The FALCO catalytic oxidizer is usually supplied with a booster blower with flow exceeding the stripper flow. Contacts are provided in the FALCO control panel which enable the stripper water pump once the catalyst is at treatment temperature. 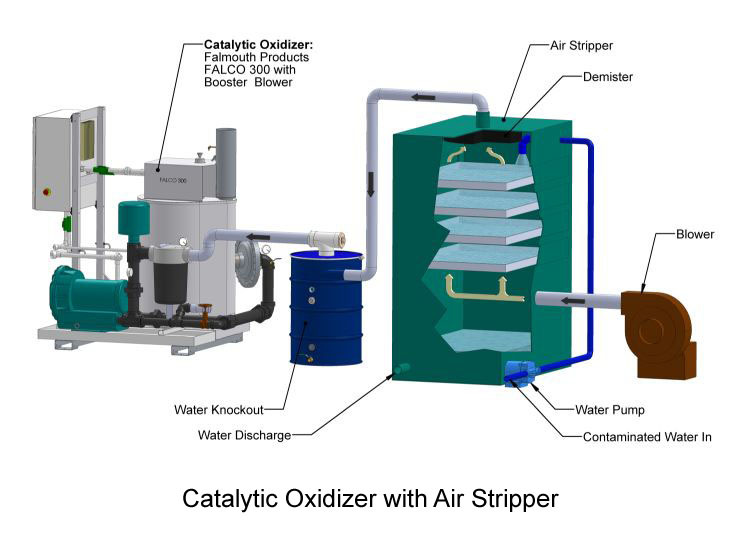 Catalytic oxidizer alarms are also interlocked with the stripper blower and water pump to provide shutdown if vapor concentrations exceed the maximum allowable for the oxidizer, or catalyst temperature is not maintained. A water separator is required on the discharge of the air stripper to prevent water from entering the catalytic oxidizer.